To contextualize this question and my response, a few weeks earlier I had ranted to my research partner about my frustration with the condescending tone that seems to emerge in nearly every initial conversation I have with a Chinese acquaintance, and can even pop up now and again even after I think we’ve established some sort of mutual authenticity to our relationship. As any foreigner who has spent even a day in China knows, this begins with ‘wow your Chinese is so good!’ the second you utter ‘Ni Hao’, to the response that ‘China is complicated, you know, we have five thousand years of history’, that can follow you to the day of your departure. Suichang: this is the best place in China, really, the best I have ever seen in the whole entire world! His grandparents’ patio: this is the most beautiful patio in the whole entire world! A random village we visited during some fieldwork: this is the best village in the whole entire world! Some baijiu we drank during said field visit: this is the best baijiu in the whole entire world! I replied that in China it is easy to point a finger at the government. There is this tangible external force ‘modernizing’ the landscape at an unbelievable pace and often disregarding any question of complicity in the process. On the other hand, in the US, just because there isn’t one nefarious outer force steamrolling the landscape, the marketization of our social, political, and environmental relationships have had far-reaching consequences. Articulating our contemporary contradictions between the state, market, society, and nature feels like screaming for breath while chugging air and drowning in the atmosphere. Our democracy suggests that as citizens we should enjoy the privilege of representing our own economic interests and defending our rights as individuals under the rule of law. Yet, as individuals we are inextricably engrained in, and therefore so hard-pressed to change, the contradictions we may try to bemoan. In China, I have heard (his son told me this) that beyond the deeply destructive havoc State Capitalism has inflicted on Chinese society and the environment, the complexity of social relations and the traditions they carry may not be easily penetrated by the market. 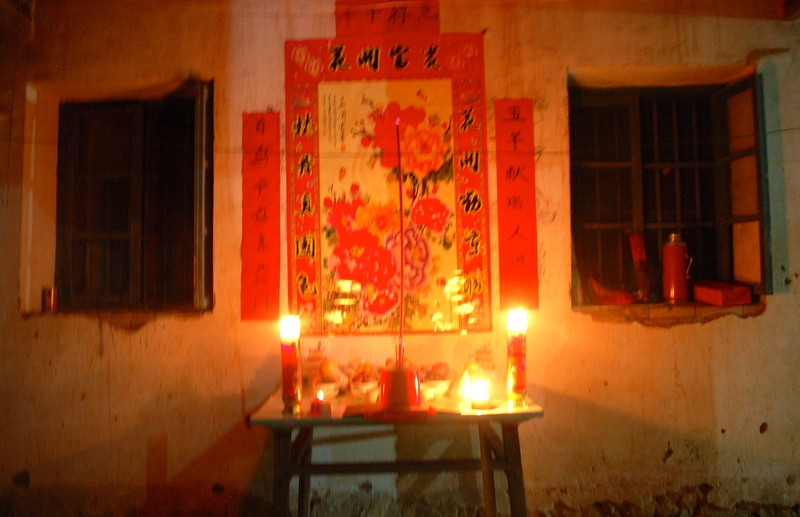 Ok, I didn’t say it exactly like that, but the basic idea was the same, and the conversation finally brings me to the point of this post: social relations, traditions, and Chinese New Year. 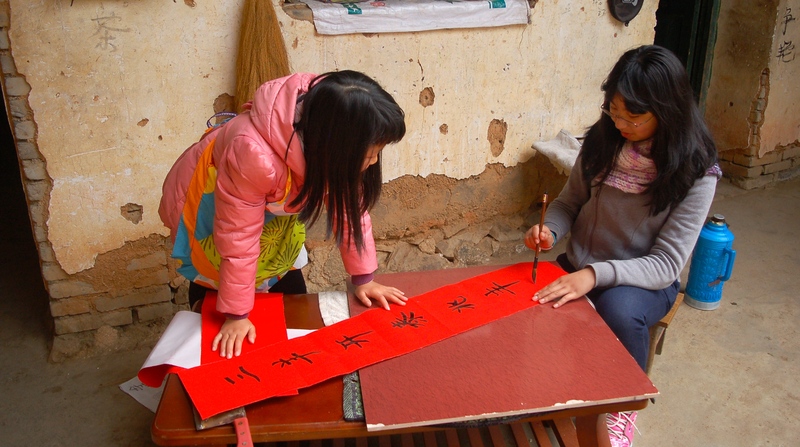 Like last year, I spent the Spring Festival with a family I have been close with since I started doing rural field visits back in 2010. In my 2014 post I initially published an overzealous day-by-day play back that was basically a word-for-word copy/past of my field notes. I have since come to my senses and realized that no, Elena, not everyone wants to read every minute detail of your stream-of-conscious observations. So, out of courtesy to you, dear reader, below you may find my abbreviated 2015 version, with more pictures than words. We’ll be there in 20 minutes! Was the the text my research partner sent me as I rushed to finish packing my bags. 15 minutes later his father pulled up to my dorm and we set off for the 3 hour drive to Suichang. 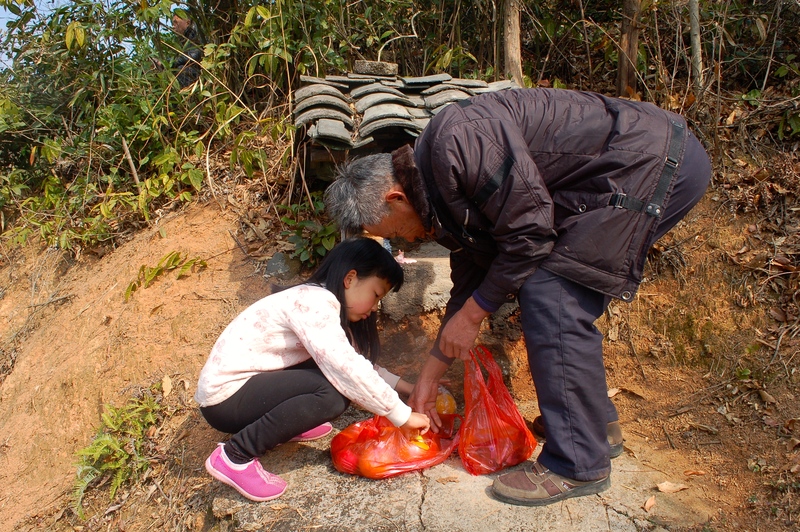 After arriving at his grandparents’ home, Aiqiu and her husband soon pulled up to the driveway and piled out of the car. After an exchange of hugs and laughter I hopped into the car beside the younger daughter, Zhu Zixi (Xixi) and we sped off towards the house. The following day Xixi knocked on my door to wake me up, and we headed downstairs for breakfast. After eating we went for a walk through the tea fields while playing ‘I spy’. The next day my research partner and I visited the home of my Hangzhou-based library study-buddy, whose parents live in Suichang. When we arrived at her parents’ home we sat outside on the patio overlooking the tea fields, and then went on a walk up through the mountains. 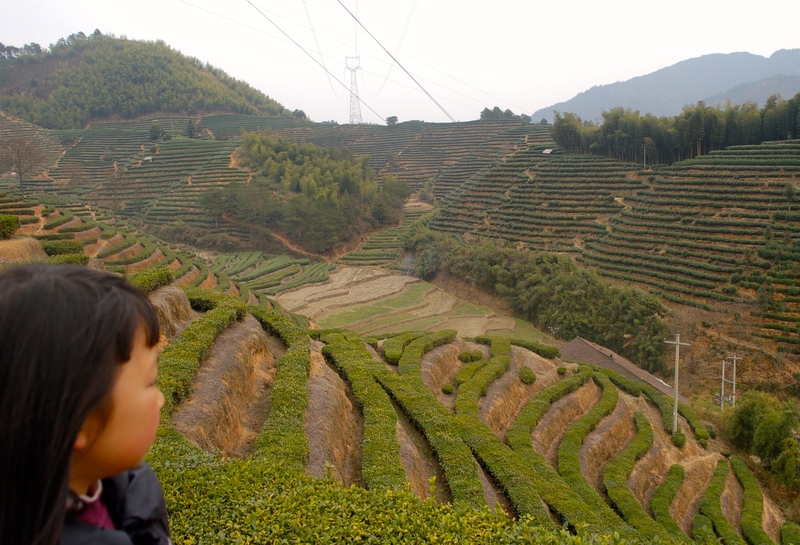 On our walk, her father explained that their village’s tea farm is organic. 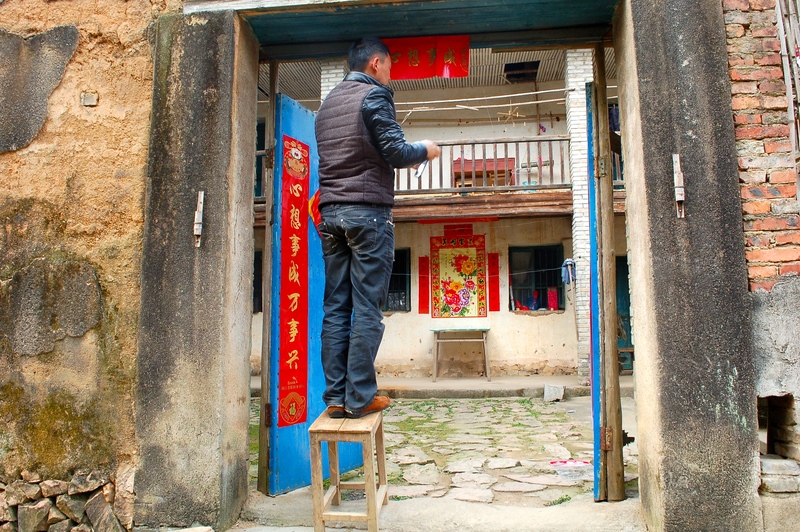 The village collectively contracts the land to a tea-farm boss who has come from the Suichang county seat (he is not from the village). Most of the people hired to work on the farm are from Jiangxi province. 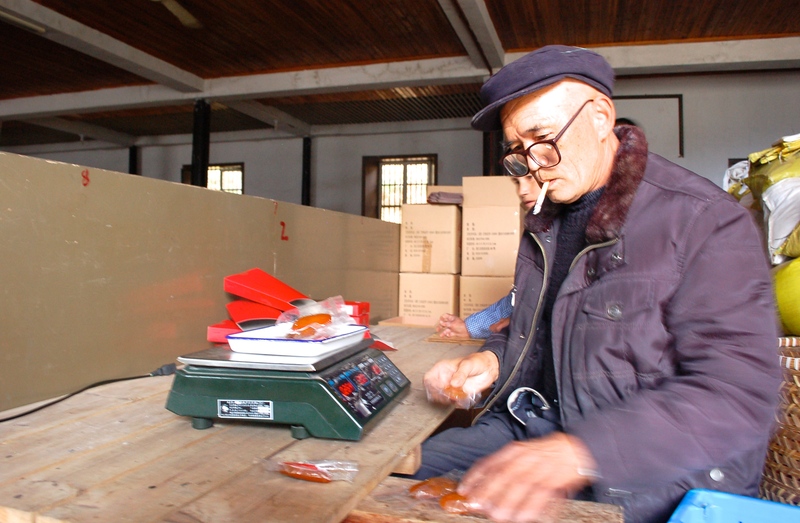 During the winter, when there is not any work to do, the man who now contracts the tea farm uses the vacant building to package and sell dried sweet potato. On the morning of New Year’s Eve, just like last year, the girls painted ‘duilians’ that were hung up around the thresholds of the doors. 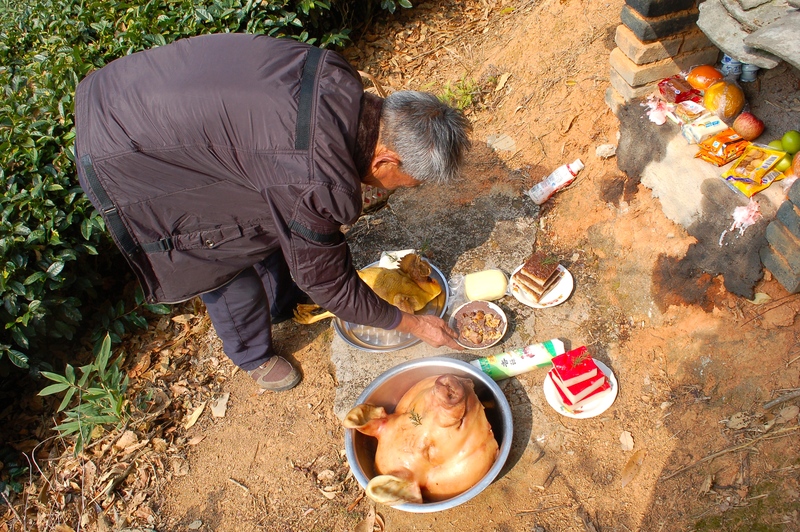 Then, after setting out an offering in front of the house, the grandfather, father, Xixi, and I packed the basket with a pig head, chicken, snacks, wine, and fruit to make an offering at their alter set in the side of one of the mountains in the tea fields. In the afternoon, after cleaning the house and setting the altar, we spent the evening watching the Chinese Spring Gala, that gathered 704 million viewers last year (and that was a bad year for ratings). The following day everyone woke up late, and after lunch I sat outside talking with Nainai. She said that this year around March they will start picking tea again, and then in April workers will return to help with the tea harvest. She said each year the weather has been getting warmer earlier, which means the tea harvest season also begins earlier. 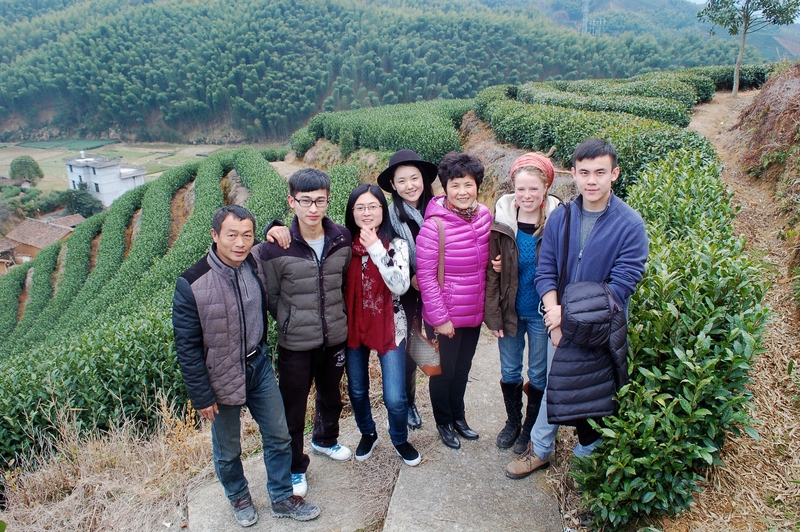 I remembered Aiqiu saying last year that because the tea had begun to bloom earlier than they had expected, they didn’t have enough people to help with the harvest at the beginning of the season. Climate change. The next day we left for Aiqiu’s mother’s house to celebrate the new year, and like last year, the road was clogged with traffic as everyone was also going to visit relatives after spending the previous day at home with their families. 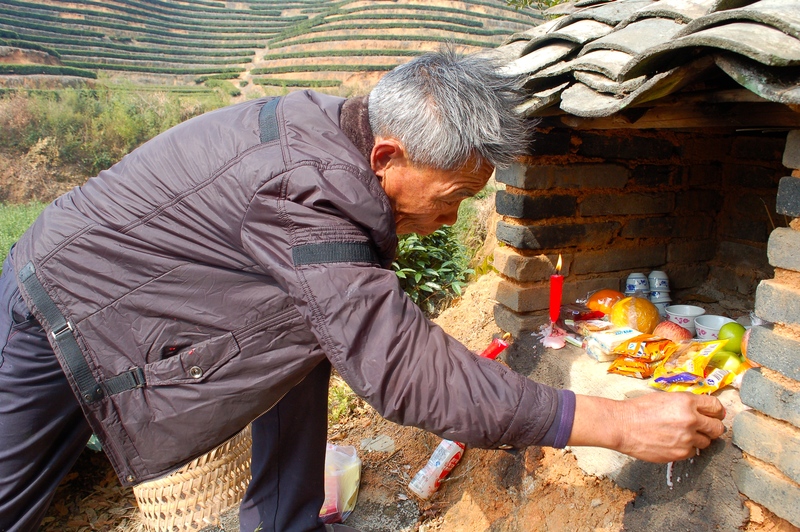 The following day I watched in the morning as the grandfather lit some paper on fire in front of their altar before dismantling it. 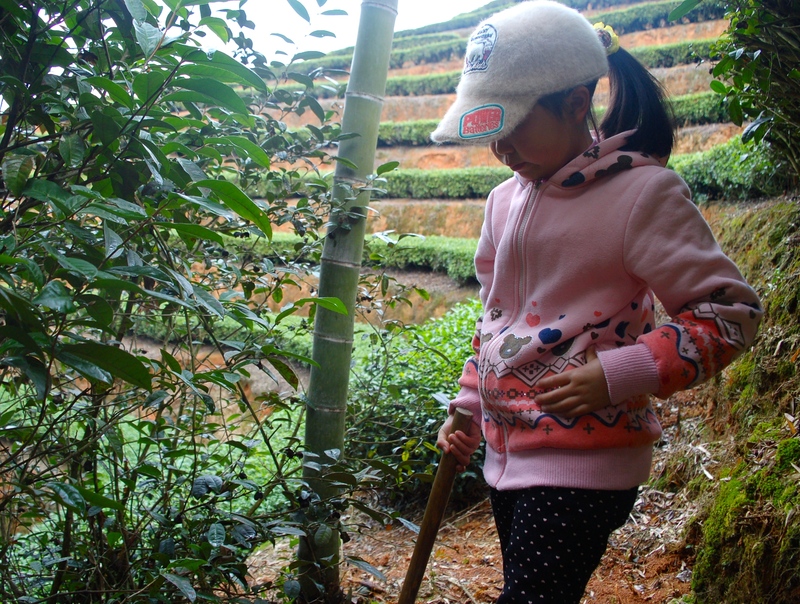 Then I spent the morning hiking through the tea fields with Xixi searching for bamboo shoots. This is a skilled practice that I still don’t totally understand despite Xixi’s multiple explanations and demonstrations. It involves digging at the ground around a bamboo stalk to see if the root retracts. 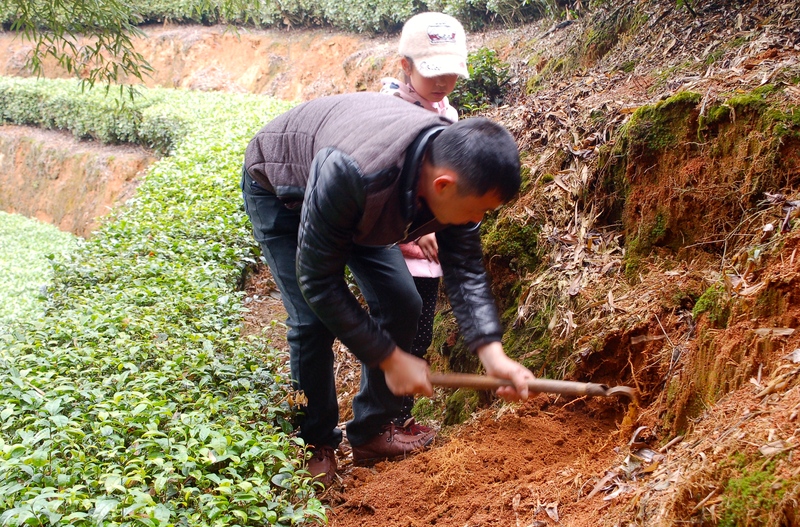 If it does, then you dig further to unearth the edible bamboo shoot. After Xixi and I dug around to no avail, we were soon joined in the search by her father, who swiftly chopped into the ground to uproot two large bamboo shoots. The final evening I accompanied the family back to the town square where the final Spring festival performance to be held was put on by a local village. The last performance we watched before it started raining involved dancers dressed in some Chinese minority dresses doing a traditional dance. Later, my professor that arranged this 2008 visit explained that the whole performance was not really ‘traditional’ but had been choreographed by some non-minority Han to promote tourism in the area. 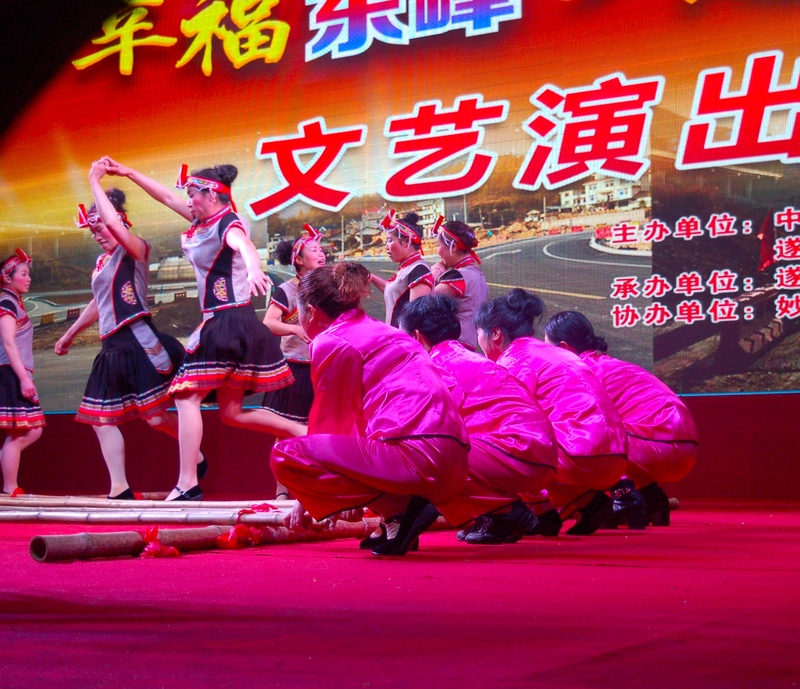 They assumed that tourists would prefer what they considered a more ‘entertaining’ performance than an authentic traditional dance (read: state capitalism steam-rolling traditions). Seven years later, I think I’m a little bit closer to an authentic understanding of the traditions and complex social relations that flow beneath state-led modernization. 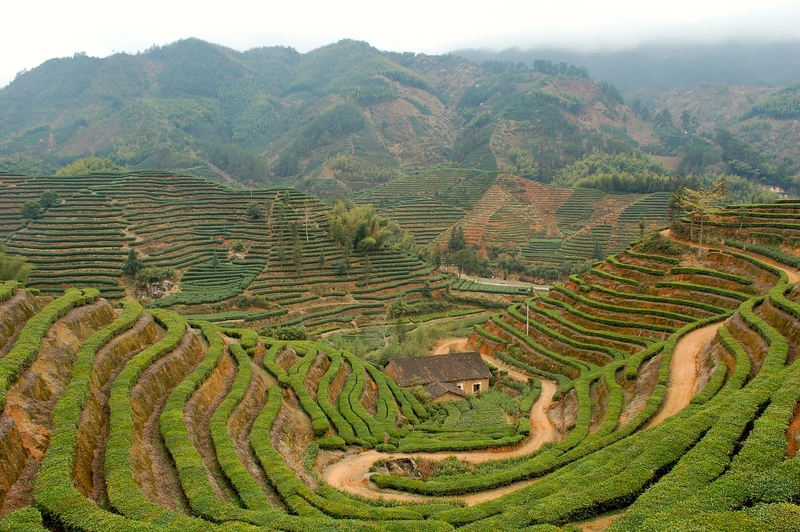 This entry was posted in Zhejiang Province and tagged climate change, organic farming, rural China, rural land-use, Suichang, tea farming, wwoof china, Zhejiang. Bookmark the permalink.